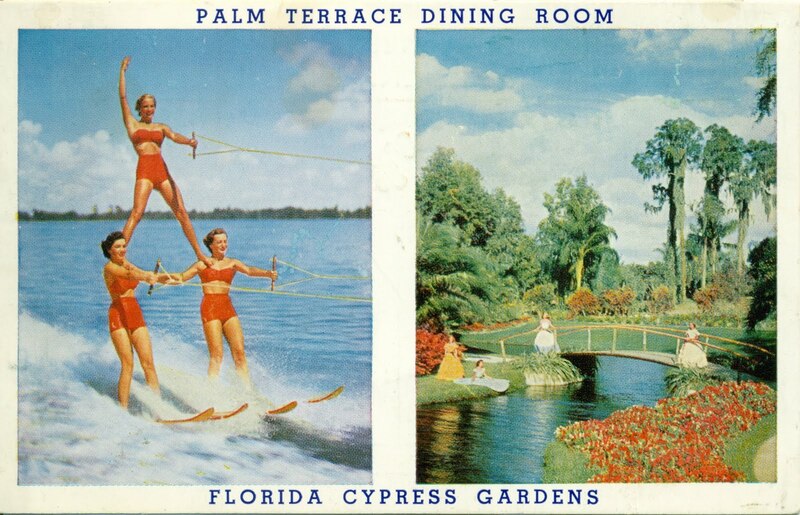 When Cypress Gardens opened in 1936, it was billed as Florida’s first commercial theme park. Carved out of a swamp near Winter Haven, the botanical gardens added water-skiing shows and other attractions like hoop-skirted “Southern belles” who strolled through the grounds, chatting with guests and posing for photographs—a little like Mickey Mouse, but prettier. 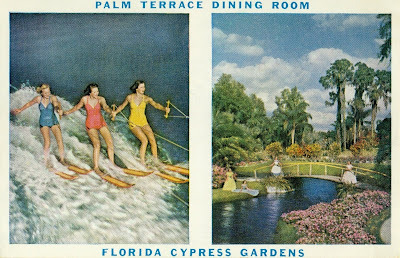 Reminiscent of a bygone era in tourism, the souvenir shop sold alligator ashtrays, flamingo figurines, and postcards. However, there were economic woes during the Korean War, even in paradise. 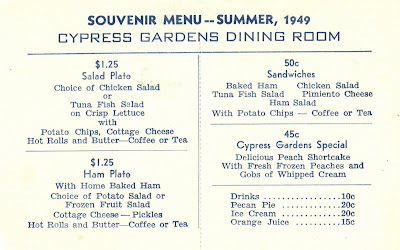 Three menus from 1949 to 1952 show that food prices at the park were increasing faster than inflation. 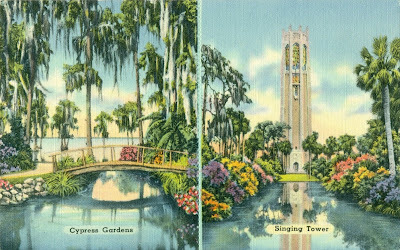 In the 1940s, Cypress Gardens was used as the filming location for a number of travelogue romances such as the musical comedy “Moon over Miami” starring Betty Grable and Don Ameche. 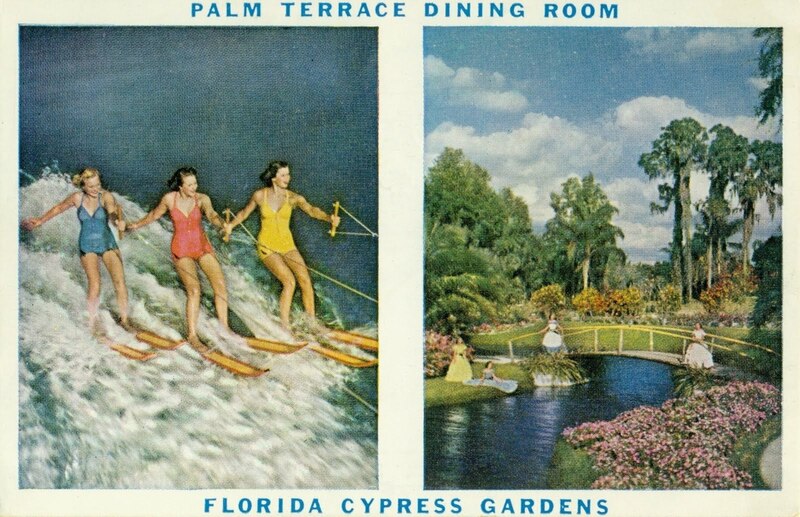 The gardens were also the site for a string of movies showcasing aquatic-actress Esther Williams and later served as an exotic backdrop for television specials and print advertisements.1 These scenes of the park were used on the souvenir menu from its Palm Terrace dining room. The card comes from 1949. 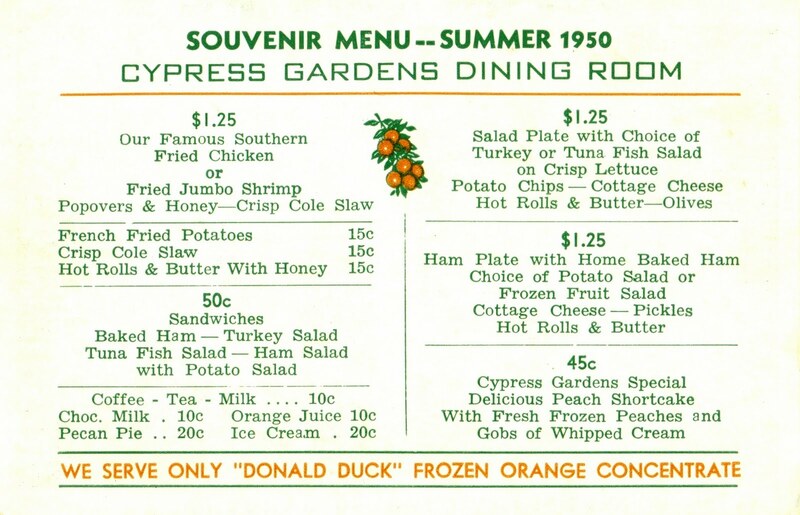 It features peach shortcake made with fresh-frozen peaches and “gobs of whipped cream, one of the perennial favorites at Cypress Gardens. 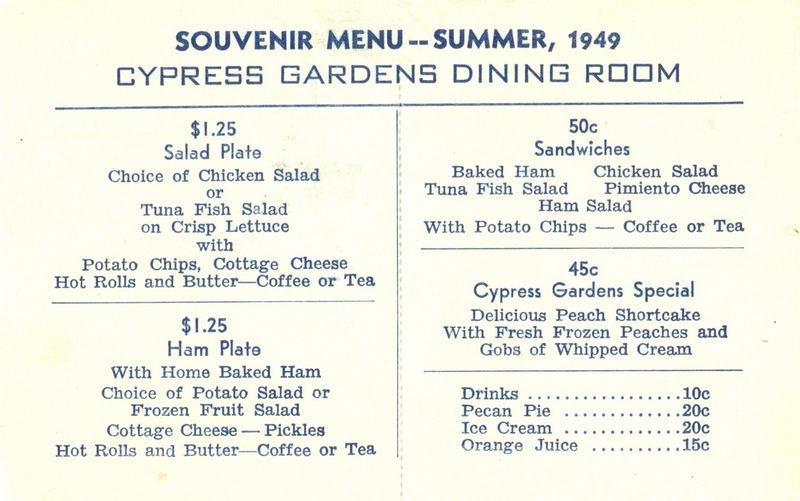 Prices were the same in the summer of 1950, as shown by the menu below that includes a new dinner for $1.25—Southern fried chicken served with popovers, honey, and coleslaw. 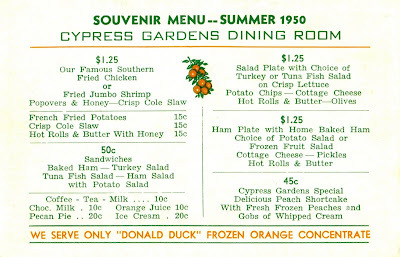 Although the park was situated in the scenic Orange-Belt ridge of central Florida, it only served Donald Duck brand orange juice made from concentrate. 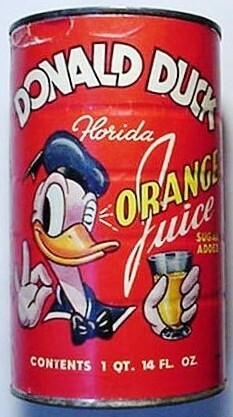 The canned juice was produced by a local cooperative (and Disney licensee since 1941) that processed boxcars of fresh citrus fruit every day at nearby Lake Wales. 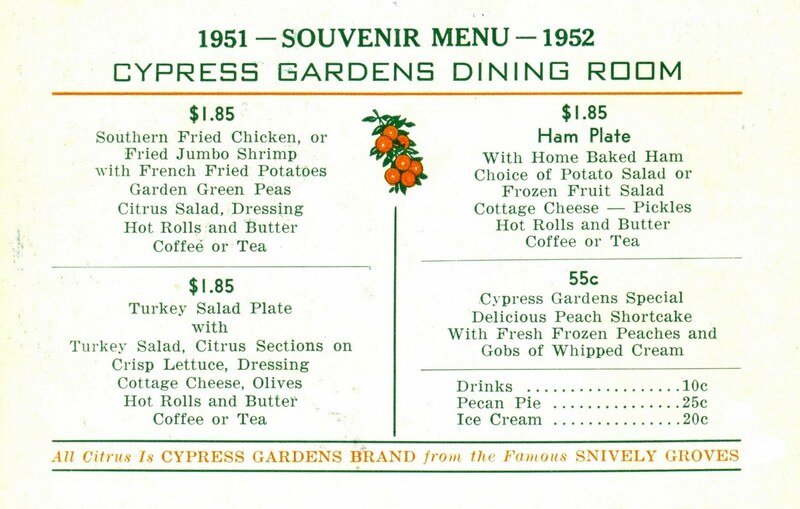 In 1951, Cypress Gardens promoted its own brand of orange juice, a change that may have been prompted by rising food costs. The higher prices are reflected on the menu below. Driven by memories of shortages during World War II, consumers went on a spending spree when the Korean War broke out in June 1950, sparking eight months of soaring inflation. However, when the feared shortages failed to materialize, consumer spending fell off sharply. The reduction in demand was so dramatic that it had a deflationary effect, counterbalancing the increase in military spending. 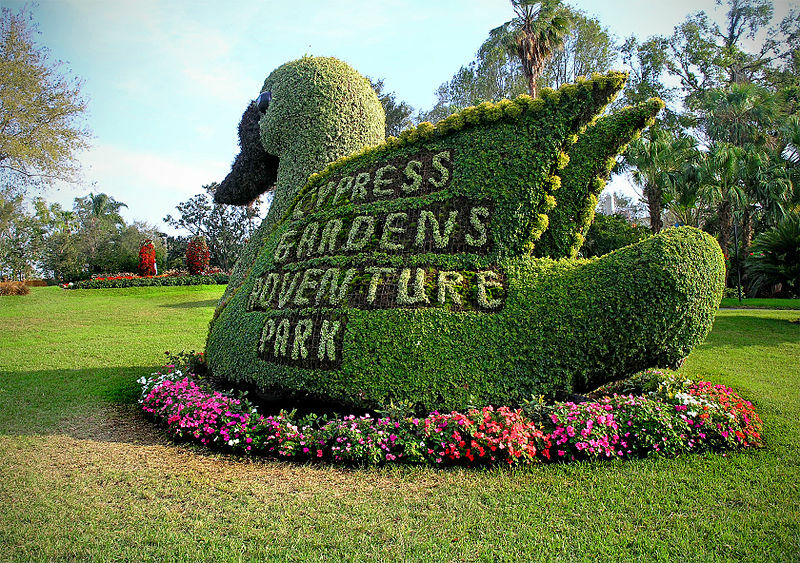 By promoting the Donald Duck brand in 1950, Cypress Gardens was unwittingly helping its future competitor. However, five years before the first Disneyland opened in California, it was impossible to imagine that the cartoonists who created the irascible duck would become a powerhouse in the theme park industry. In 1971, the self-contained resort called Disney World opened in Orlando, a center-state rival that would slowly ease Cypress Gardens out of business. 1. Released on July 4, 1941, “Moon over Miami” begins with a bouncy dance sequence at the Texas Tommy Hamburger Drive-in where Betty Grable and Carole Landis show off their talents before leaving for Miami in search of a rich husband. Filmed in Technicolor by 20th Century Fox, one scene that is revealing with regard to culinary history comes when “Aunt Susan” hands “Jack” a jar of her famous guacamole sauce whose contents are bright red, not the green color of an avocado-based sauce. The consumption of avocados was not widespread in the country until the 1950s, except oddly in California and Florida where the movie was shot. 2. The national average wage was $2,973 in 1952, as compared to $40,711 in 2009. 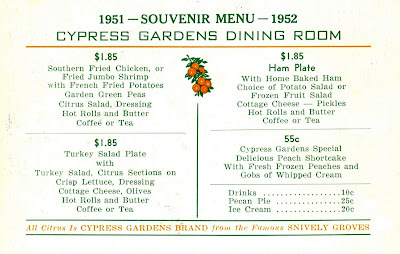 Today, the cost of the seared chicken breast entrée at the Coral Reef restaurant in the Walt Disney World Epcot Center is $20.99, roughly equivalent to the price of the fried chicken dinner at Cypress Gardens sixty years ago. 3. The mermaids performing in the underwater theater at Weeki Wachee Springs are now state employees. In one of the less-heralded government rescue plans, ownership of the venerable roadside attraction was transferred to the state Department of Environmental Protection in 2008. The following year, the manager was fired for illegally altering time sheets and making inappropriate remarks toward one of the mermaids. 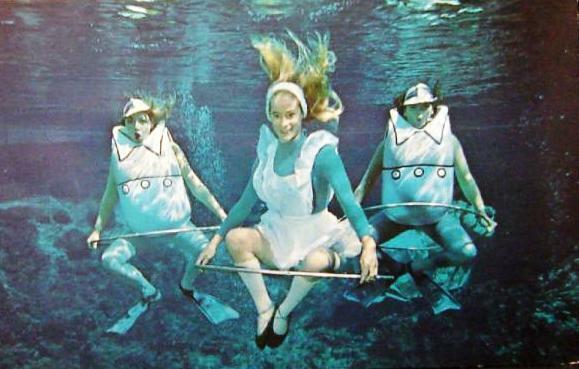 By all accounts, things have been going swimmingly ever since.